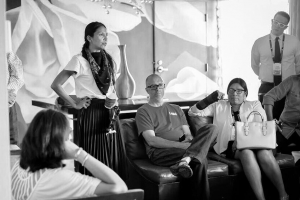 In early September, Indian Country Today Media Network called it quits — a startling revelation to all who either patronized the website and magazine or were contributing writers. That’s because ICTMN told no one that they were having financial problems, forcing their sudden “hiatus”. Since then, there has been a steady dialogue that has emerged in the absence of ICTMN, a publication that many agree was imperfect, but also, was better than what currently exists in the media ecosphere: a mostly aggregated climate of news content generated from outside journalists explaining the Indigenous narrative. In this special relaunch of Still Here, we’re taking a look at the State of Indigenous Journalism. It’s in trouble. This battle over the Dakota Access Pipeline at Standing Rock is far from over. In fact, some would say, it’s about to get real. 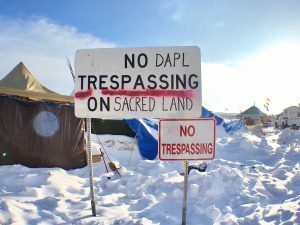 In this episode of Still Here comes a closer look at some of the new challenges emerging at the start of a new year – for the water protectors, for the Standing Rock Sioux Tribe and for a new North Dakota governor who, on day one, came out in favor of the $3.8 billion dollar energy project. In this final week before Donald J. Trump takes the presidential oath of office, there are other concerns that could sway the direction of the pipeline struggle. Right now, the focus is on Mother Nature. There’s fear of massive and dangerous flooding where the water protectors remain. Welcome to Still Here: Modern Stories of Resilience, Indigenously Told. In this preview episode, host Jenni Monet is at the Sacred Stone Camp near the Standing Rock Sioux reservation where thousands of people have gathered from across Indian Country and the Indigenous world to fight a pipeline. It’s also where Still Here symbolically launches its first pilot episode. Over the course of the next several weeks, we’ll take you to places where leaders, thinkers, and everyday doers are confronting life’s dilemmas in their own indigenous way. 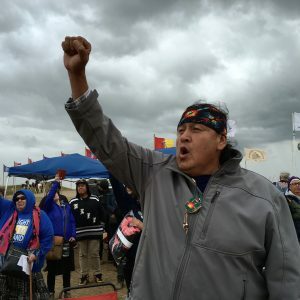 The movement building at Standing Rock is just one example of what you can expect to hear on the podcast.